A general view shows smoke rising above a dock at the Zvyozdochka shipyard in the north Russian city of Severodvinsk April 7, 2015. 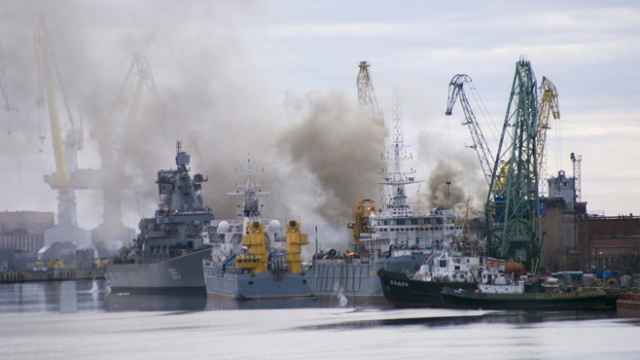 Firefighters have put out a blaze on a nuclear submarine that was undergoing repairs at a shipyard in Russia's northern province of Arkhangelsk on Tuesday. There were no weapons on board, the vessel's nuclear reactor had been shut down prior to the blaze and nobody was hurt, said the state-owned United Shipbuilding Corporation which runs the Zvyozdochka shipyard where the 155-meter (500 ft) 949 Antei (NAT0 classification Oscar-II) submarine was being repaired. "There is no threat of environmental or radioactive contamination as the result of the incident," it said. The dry dock where the vessel had been repaired was flooded with water to help put out the blaze. A source told TASS news agency that the active zone of the reactor had been unloaded at the start of repairs a few years ago. The fire started near the stern during welding work that caused insulation materials to catch fire. A blaze in 2011 nearly led to a nuclear disaster as it engulfed a nuclear-powered submarine carrying atomic weapons, a leading Russian magazine reported months later, contradicting official assurances that it was not armed.